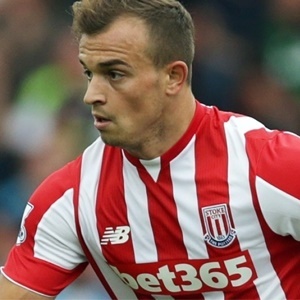 Cape Town - Stoke boss Mark Hughes reckons Xherdan Shaqiri is finally starting to make an impact at the club with his consistent performances this term. The Switzerland international is in his third season at the bet365 Stadium, having made a £12 million move from Inter Milan in August 2015 - a club-record fee at the time. Shaqiri has struggled to deliver the goods on a regular basis for Hughes' side in the past, but the Welshman has noticed a massive improvement in the new campaign, which has brought two goals and four assists in 10 Premier League appearances. Speaking in his pre-match press conference for Monday's league clash with Brighton, Hughes praised the 26-year-old winger for his new-found focus which is having a positive affect on the team. Commenting on Shaqiri's fee, he said: "In the current market it doesn't look a significant amount. For us it was still significant money. "But you'd have to say - not that we are encouraging or advocating that we want to sell him - he'd be worth a hell of a lot more than that if he was back in the market. "We've all seen the difference in his decision-making and its impact on the team. Sometimes maybe through the (previous) seasons that sustained impact wasn't quite there. "It was all about getting used to the Premier League obviously, and understanding who he was up against. He is taking on more the role of the main instigator of our attacking threat. "I think the whole team responds to that, you sense that maybe something's going to happen. I think the crowd senses it as well, and I know opposition teams sense it too. "Since he's come back in pre-season, he's been first class. I don't know what it is but he came back with a real focus of making sure he was going to have a good season. And he's sustained it."